Slightly less brutal than a pink slip. I’d love to say I’ve never been fired, but I have. A few times. And it sucked pretty much every time. As I get older, in retrospect, I realize my being fired was probably a good decision on the part of the organizations who let me go, and not nearly as personal as it felt at the time. Part of that “pruning thing” we discussed. But we are writers. Why do we need to talk about firing people? Namely, because I mentioned firing people in yesterday’s post and someone privately messaged and asked I address the topic. I like to believe I’m here to make you laugh and learn, but sometimes we need to talk about the un-fun stuff, too. Dead weight can keep us from reaching our career goals, so here goes…. Writers are entrepreneurs, and no matter which publishing path we choose to take, we will (if we are smart) have to hire people to help us succeed. Doing everything ourselves and micromanaging and controlling is a formula for burnout and frustration. Learning to hire and fire well is a critical skill and one we will always be honing. Firing will never be fun or pleasant unless we happen to be sadists (which I assume most of us are not). Writers need web designers, cover artists, literary agents, personal assistants, formatters, accountants, publishers (especially for the indie authors), and even sometimes attorneys. These are just a handful of the types of people we as writers might employ. If these individuals do their jobs well, we can rest assured that we can focus on what we do best…writing books. Yet, if we have “employees” who are dead weight or troublemakers, it can kill our creativity and triple our workload. Confrontation isn’t fun. Most of us avoid it at all costs. Yet, confrontation is critical to healthy relationships (including work relationships). There have been times in my past I feel I was unjustly fired. I once worked for a technology firm as an admin. Originally there were two of us, but the other left for another job. For months, I did her work and mine while the company searched for her replacement. I was continually told how valuable I was and how appreciated, so imagine my surprise when one day I was being walked out the door. To this day, I don’t know what I was doing wrong. I was getting mixed messages and was never confronted. Clearly I was doing or not doing something that was hindering progress, but I didn’t know what or how to correct. This means if someone isn’t working out (too many delays, not delivering, not performing), we need to lovingly confront first and offer an outline for how to change. Be clear. Don’t hint. People can’t fix what they don’t know about and it’s poor leadership to expect others to read our minds. So when do we fire? I believe in the Three Strikes and You’re Out. If by the third time we’ve talked, things aren’t changing, then it’s time to part ways. Web people who don’t do perform, agents who don’t return e-mails, or editors who are taking too long need to go or it creates major problems that will take our valuable time to repair. When it comes to business, I am definitely a work in progress. Much of this I’ve learned from the experience of (for the first time) being on the other side of the operation. I also tend to be about as ruthless as a rose petal, but I’m learning to toughen up. When it comes to running a business (like WANA International) not firing those who need to go hurts others in my organization. It sends a message I don’t care about those in my operation and that we don’t have standards for performance. It drags the company down. As an individual author-entrpeneur, not firing can affect our career, our health and our intimate relationships. Endure the stress of an agent who doesn’t return e-mails for months at a time and you’ll understand. We need functional web sites to do our jobs well. Not having a web site, a bad web site or an ineffective web site hinders our performance and growth. This person only sees problems and never solutions. This kind of negativity will adversely affect you and your organization. We are who we hang around and if we are around someone who only sees problems and obstacles, we can catch that like a virus. But if all this person is doing is nitpicking and whining? Time to go. People should do more than take up space, especially if we are paying them. I’ve had people who were hired to assist at certain events who just didn’t bother to show and never called to tell why. This placed me in a terrible and embarrassing position of explaining where this person was. It negatively impacted how others saw ME as a professional. It also hurt my company and those depending on me because I didn’t have time to fill the position and this wasted precious time and energy. It also hurt my health because I was trying to do the job of two people and that just meant I did my job really poorly and wore myself out. In fact, on one occasion, I was so exhausted and scattered from doing two people’s work, that I ended up whacked in the head with a trunk lid that gave me a nasty gash, a concussion and a near-miss to the ER before the main conference even began. Needless to say, I was not at my best that week. Thousands of dollars in conference, hotel, travel went to waste because, without help, I was unable to mine the investment as I’d planned. The Uncommitted can KILL a business. If we hire someone to do a job then realize they over promised and are out of their depth? Not our job to wait for them to learn what they were hired to do. When we originally hired web designers for the WANA International site, it required a complicated shopping cart system to handle what WANA wanted to offer. The designer (though a lovely person) just did not possess the skill to design something so complicated. Me “being nice” cost us four months of delays. Sometimes the person might be talented and capable of doing the job, but too many personal crises are getting in the way, rendering the person inept. “Letting someone go” doesn’t have to be permanent. It can go with an understanding that the person is eligible for rehire at a later point when life has calmed down. Sometimes, firing really isn’t personal. The person/company just might not be a good fit for the job. This often happens with agents. They could be a fabulous agent for other works, but be terrible when it comes to our books (or genre). My cover designer is fabulous. In the beginning, though, he kept insisting on using a cover model for the cyborg because it was easier and maybe even prettier since I am no Vogue fashion model. I gently and firmly said, “I want to be on the cover. I don’t care how it happens, but make it so or I will hire someone who can.” And he made it so and that’s why he’s a keeper and I send him all the business I can. But sometimes, we get a rebel who just won’t listen to instructions. When we hire someone for a job, we need to be clear what we want. On the other side, that person needs to listen. When you instruct a web designer to fix a shopping cart and “under no certain circumstances touch the look of the web site”, and they ignore you and change it to what they like? It’s our business, not theirs. You have a right to expect what you pay for. This one, I feel, is the most critical, especially if you are running a larger organization (I.e. an indie press). Some people love drama and back-biting. They stir trouble often because, as long as there is drama, it masquerades that the person really a) is slacking off and not doing his/her job or b) is incompetent. Seeds of Discontent are often also Complainers. They fracture solidarity and undermine morale. They create distrust and paralyze decision-making and thus need to go. Promptly, privately and professionally. I’ve learned this the hard way (like a lot of stuff). I’ve worked with people I knew needed to go. Instead of acting, I whined, complained and groused while the situation grew steadily worse. NOT a recommended action plan. When we don’t fire, we think we are being kind to the other person, when in fact, we’re being selfish. We are putting off our own discomfort. We don’t want to be “the bad guy.” Maybe we’re prideful and don’t want to admit we made a mistake in choosing the person for the position. Perhaps, we are afraid or uncertain. We have no clue how to fill that vacuum when the person leaves so we endure the bad instead of embracing the possibility of great. In retrospect, I am happy I was fired from those jobs of my youth. I hated working in admin and was terrible at sales. If I hadn’t been let go, would I have ever found my calling? Would I have ever had to face the character flaws that were holding me back? Firing is major pruning. It hurts, but sometimes great things blossom. I hope this has been helpful for you. I know I am still learning by leaps and bounds and not always doing things perfectly. As writers, we can be enamored with having an agent, or we feel committed to the editor, but in the end, we are the only captains of our fate. If we hit the rocks, the blame is on us. What are your thoughts? Have you had to fire someone, maybe an agent? What did you learn? Have you been fired from a job then later realized it was a blessing in disguise? To prove it and show my love, for the month of August, everyone who leaves a comment I will put your name in a hat. If you comment and link back to my blog on your blog, you get your name in the hat twice. What do you win? The unvarnished truth from yours truly. I will pick a winner once a month and it will be a critique of the first 20 pages of your novel, or your query letter, or your synopsis (5 pages or less). ANNOUNCEMENT: I have a class coming up SOON, Creating Conflict and Tension on Every Page if you want to learn how to apply these tactics to your writing. Use WANA15 to get 15% off. Also, my new book, Rise of the Machines–Human Authors in a Digital World is NOW AVAILABLE. I will announce July’s winner tomorrow. There’s one other kind of termination I thought I’d add–severing unhealthy relationships. I’m learning the same basic you outlined for employees hold true for the relationships that impact my life–be it in my writing life or anything else. I can’t be afraid to move on if the people feeding my craft don’t add to the bottom line OR if I’m paying back what was given to me. Funny you should ask. Just fired my agent, by certified letter. Haven’t heard anything back, and who knows what or if I will? I made the decision a long time ago but put it off, dreading it. Firing someone means admitting to yourself you made a poor choice hiring and/or communicating and managing them. But sometimes it takes a while to realize it is a poor fit that can’t be fixed. My first agent I parted ways affectionately, respectfully and reluctantly. This one is not that. I’ve been fired a few times. Not fun. Been working for myself many years. That nasty ole boss can’t fire me now. Speaking of firing I was thinking of hiring? How does hiring an editor work? What is expected of them? I mean, they’re not beta readers, right? Do they “just” do grammatical editing? I’m trying to get the nerve to fire myself and hire someone to do some of this tech stuff. Any suggestions? I’ve been on both sides of the ‘firing’ table and neither experience is much fun. I will say that I have been let go more than one time where I felt better communication on the part of my boss could have saved the relationship, but water, once under the bridge, does not return. I have fired myself more times than I care to admit. There are some people for whom I simply cannot and will not work. Those whose grasp of the truth is tenuous at best come readily to mind. I’m in a very stable position now in a job I plan to be at until such time as it drastically infringes on my writing income. Just remember, firing someone gives them the opportunity to find a job for which they are better suited… or become someone else’s problem. “We hire our own nightmares.” Every ‘boss’ should have those words posted in their office. Good post, as usual. 1) As I am involved in a business with contracts and clients (architecture) they’ve all instilled in us to be very clear in your contract how to end the contract early (ie. fire the person providing you with services). You do have to be able to clearly define a line and pay them up to that date for services rendered. I’ve been on both sides of this. 2) As someone with a brief stint in HR, you also have to be very sure that not only do you let them know in advance what needs to change, but you also have to keep documentation on it too. (Think performance reviews) Otherwise, they can cry fowl and hold you accountable. 3) Don’t forget to look up your local severance rules, and if you’re Canadian, things like filling out a Record of Employment so they can claim benefits in Canada. (Not sure what the US regulations are). If in doubt about all this, contact your local Human Rights advocates. HR can be a scary thing. But if you’re in a business big enough to have a payroll system in place, often these services have access to HR personnel for a nominal fee. WANA doesn’t have official employees. Everything is contract work, but 1 & 2 are definitely things we are working on and improving. I imagine that some of the indie publishers who are growing big enough can really benefit from this. THANKS! I was working a company that I began to dislike. I loved working in the hotel industry, but there are different companies. I took the month of June and July off to help promote my husband book. It has taught me about twitter. I work as a consultant in my day job and as an ebook formatter on the side (another kind of consulting). The thing about consulting is that you can be fired and not even know it. The client just never calls you with another job. Sometimes they simply no longer require that sort of service. But sometimes they don’t call back because you’ve underperformed. To be successful, you have to learn to give yourself an honest performance review. As someone who has seen this too, we’ve often asked clients for ‘debriefings’ for why we didn’t get certain jobs, especially when you’re bidding for them. You can always ask them for feedback on why work stopped at that point. Like you said, Kristen, this is a business. You have to look out for your own product if no one else will. I was working for an organization that was highly stressful in a job that I was over qualified for. It was meant to be a temporary job, but I soon found myself making friends and settling in to the job. A fellow employee decided she didn’t want me there. So told lies to my boss, who was never around to see my job performance. I was even escorted by two security guards off the premises. As traumatic as it was I realized later it was a gift. If I had not been fired, I probably would have stayed there. The job left me too stressed and tired to anything else. If I had stayed there I never would have returned to my first love, writing. I had become to content in a job I was not meant to do. Also, as a bonus, my borderline high blood pressure returned to normal after I was fired. So you could say it had a double bonus. I’ve never been fired, but I’ve had to “let myself go” from a job that I dearly loved. I couldn’t handle anymore of the beaurocracy when I taught High School English. It was rather poisonous school where the kids had the run of it. I probably would have been fired if I tried to stay with it. I was falling farther and farther behind because of the stress. I might have been able to handle it if I’d known then about my gluten allergy. Now that I do, I’d like to give it another shot after my kids are all in school. The Fraternal Orders causing trouble for me the past 30 years would tell people that they were not trying to get me fired because I would be able to collect unemployment until I could find another job. They were trying to get me to quit, like quit college. It is like today, to quite writing. Now, the strategy is that I cannot take my wealth with me when I die so why bother trying to be successful. They believe I can be so why would I quit until I die? Priests as the house father of fraternity houses lose logic when they cannot bring pledges to their knees. I was fired from the Bank of Montreal by a so-called professional in administration who went about it all wrong–not professional in any sense of the word. And I told her that. I feel I was let go unfairly and was affected by it for many years. I was in training when they fired me, they should have had the professionalism to at least let me finish the training. I earned my diploma in Bank Telling so the interest was there, but not the professional support on their part. I learned to hate and mistrust people after that, because to be fired at a young age is to be devastated to the max. At a young age you look up to people, you rely on them for guidance. You want to do good, you want to impress people, so being fired was a hard cruel blow to my fragile but determined spirit. Your cover designer thought he could find a prettier model for the cover? No way! Thanks. I think it was the stock model was easier to work with instead of a picture of me. He rocked it. Sometimes I’d like to fire family members and “well-meaning” friends. Never been fired, but had to sit in on a firing once. Not comfortable at all. I’ve been fired from exactly one job. They had a good reason, but I violated a company rule I didn’t know existed. My only wish was that I’d been given a chance to correct my error. But they went for one strike, you’re out. I SHOULD have been fired from my waitress job (while in college), because honestly I was TERRIBLE. I am forgetful by nature (“Oh, I forgot you ordered that!”) and clumsy (spilled and tripped all the time). I would have fallen right into that Inept category when it comes to waitressing. I did learn, however, to tip better after doing this job. Excellent post, Kristen! Thanks for the great advice. My background (35 years) before becoming a freelance writer was the construction business. The publishing industry is remarkably similar to the construction industry and that is no surprise. Why? Because business is business. What I have observed is this; creative types are often bad at business-they run the other way. I am a right brain creative type ( writer, painter and musician) and I mastered business in deed and concept. Artists of every kind need to understand that mastering the art, no matter what kind, is only haft the required effort. Writers must switch hats if they want success. I did it, so can you. I just got a contract, for example, for my second novel that I rejected because I understand contracts and this was a bad deal. Every writer needs to be an educated player in this game of business called publishing. If I were a star-eyed writer I would have screwed myself on that contract. Lots of other writers get screwed by lack of understanding. Don’t hurt your self, learn the ropes. Kristin, I was trying to buy your book WE ARE NOT ALONE in Kindle format but its not available on Amazon. Is there somewhere I can buy it in e-format or PDF? (It’s up on PDF here but I thought it might be pirated http://www.ebookpdf.cc/we-are-not-alone-the-writers-guide-to-social-media-w…? It’s outdated. 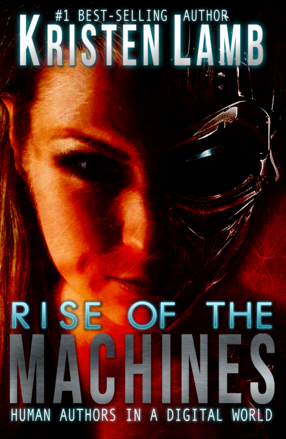 I’d recommend getting my new one “Rise of the Machines”. Anything in WANA that was still salient is is ROM. And the step-by-step is current and there’s an entire section on how to blog to connect to readers.